‘Nava’ means nine; ‘Graha’ means planets. 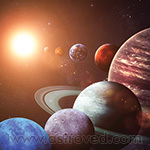 As per Vedic Astrology, there are 9 planets that influence your lives. The position of a planet at the time of your birth will have an influence on your actions and reactions to different situations in your life. Your Life will have its own ups and downs. 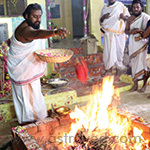 The Navagraha Homa (Fire Lab) is performed to invoke the blessings of the nine planets who govern your life. The placement of the 9 planets in your birth chart indicates your karma and the level of success or failure you will enjoy in your life. At times, there are chances that one or more particular planets may be afflicted to create stumbling blocks in your life. 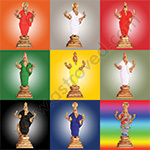 Performing this Navagraha Homa can offset the negative influence of the afflicted planets. You can enjoy longevity, good health, wealth and happiness by performing the ceremony to appease the nine planets for obstacle removal. All the nine planets play a significant role in your day-to-day life, and performing this homa (Fire Lab) can help you take full advantage of the powers they represent. The energy from the ceremony can neutralize the malefic effects of poorly placed planets and enhance the positive aspects of their attributes, allowing for a more meaningful and pleasant existence. Why perform the Navagraha Homa? The Navagraha Fire Lab is performed by our highly trained priests in accordance with the procedure prescribed in the Vedic texts for each planet. Special mantras and hymns are recited to derive the maximum benefits. 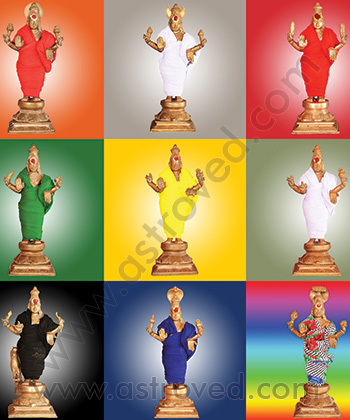 All nine planets (Navagraha) are honored in this unique ritual. This special planetary homa can be performed on any auspicious horas. Performing the Navagraha Fire Lab has the power to release tremendous spiritual energy, which can help you overcome the difficulties of day-to-day life, and help you live in peace and harmony. 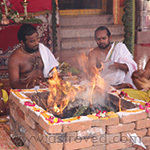 This Navagraha homa (Fire Lab) performed for 6 months, once a month, invokes the blessings of the 9 planets. 'Nava’ means nine and ‘Graha’ means planets, who govern your lives. Their placement in your birth chart indicate your karma and the level of success or failure you enjoy in your life. Appease the 9 planets with this special homa to overcome suffering, get rid of obstacles and enjoy good health, wealth & happiness. This Navagraha homa (Fire Lab) performed for 12 months, once a month, invokes the blessings of the 9 planets. 'Nava’ means nine and ‘Graha’ means planets, who govern your lives. Their placement in your birth chart indicate your karma and the level of success or failure you enjoy in your life. Appease the 9 planets with this special homa to overcome suffering, get rid of obstacles and enjoy good health, wealth & happiness.